I tried not to be impressed with this movie because to me the idea of making a live-action film that follows the original cartoon scene-for-scene seemed almost like a waste of time. I really tried, but I failed. 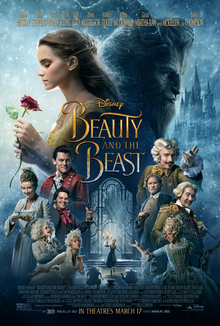 At two hours and nine minutes, Beauty and the Beast is easily the longest of the new Disney live-action remakes, and it rivals Jungle Book as the best. Yes you have seen the story before and you know how it ends, and yes you know the songs. But we all knew how Titanic was going to end, and yet it is considered one of the finest movies ever made. I am not sure Beauty and the Beast will reach any kind of iconic status, but knowing how it is going to end should not stop you from seeing it. If you have not seen this movie yet, then take the time to see it while it is still on the biggest screens in the area. This is a perfect drive-in movie, from its visuals to the incredible sound production that goes along with it. This movie looks like it took decades to make because of all of the elaborate live-action scenes, but we get this movie now because of the technology we have available to movie makers. I am not normally a fan of remakes, but this one was well worth the time. I guess we should get the politics out of the way, just in case anyone was wondering. I know that theaters in the south banned this movie because they didn't like one particular character they had heard about in advance. But I can guarantee you that the sexual orientation of one character was not the only problem narrow-minded people had with this movie. There is plenty here for the newly emboldened offended class to get up in arms about, but it is really their loss. Emma Watson is not exactly who I would have picked to be the live-action version of Belle. But her on-screen performance is definitely spot-on, and she brings an element to the movie that makes it much more enjoyable. I found it impossible to argue with any of the casting done with this film, and that is unusual for me. But to be honest, not one actor seemed out of place, even when they were voicing their enchanted characters. The one aspect of Beauty and the Beast that took some getting used to was seeing the cartoon elements in a live-action format. The wolves are terrifying, and little people might not be able to handle that. The action is much more pronounced with live-action movies, and that makes this movie much more fast-paced than its animated predecessor. All in all, this is not the kind and gentle cartoon version of the movie that we are used to. Live-action has a way of making everything more intense, and that does make for some gritty scenes throughout the movie. Disney added a few characters here and there, put some new lyrics into familiar songs, and added songs that we had not heard before. I got the impression throughout this movie that the 1991 animated version was more incomplete than I had originally thought. The songs, and even lyrics to familiar songs, seem like they were written for the 1991 movie and left out. It is either that, or the artists who wrote the new material were able to expertly capture the mood of the original music and mix their new creations to stand side-by-side with the songs everyone already knows. Either way, as a complete piece, the music in this movie works in every way. I wanted to dislike this movie. I wanted to say that "I told you making this a live-action film was a waste of time and money." But my preconceived notions about this film were wrong. This is a wonderful family movie (that does require a little bit of editing by parents at times) that is made for the big screen. Go see it, and be sure to go see it at the drive-in. George N Root III is a movie fanatic who learns something new with every movie. Follow him on Twitter @georgenroot3, or send him a message at georgenroot3@gmail.com.